When thinking of conflicts over natural resources, we tend to think of rural resources: oil in South Sudan, deforestation in Bolivia, dam building in the Brazilian Amazon, blood diamonds in Angola. In the United States, one might recall the Spotted Owl or, more recently, the Keystone XL Tar Sands Pipeline campaign. Natural resources permeate cities as well. They include street trees, parks, beaches, rivers and creeks. As Alex Schafran reminds us, it's important to remember the urban when thinking of the protests in Turkey. Likewise, we shouldn't forget the urban in conflicts over resources. 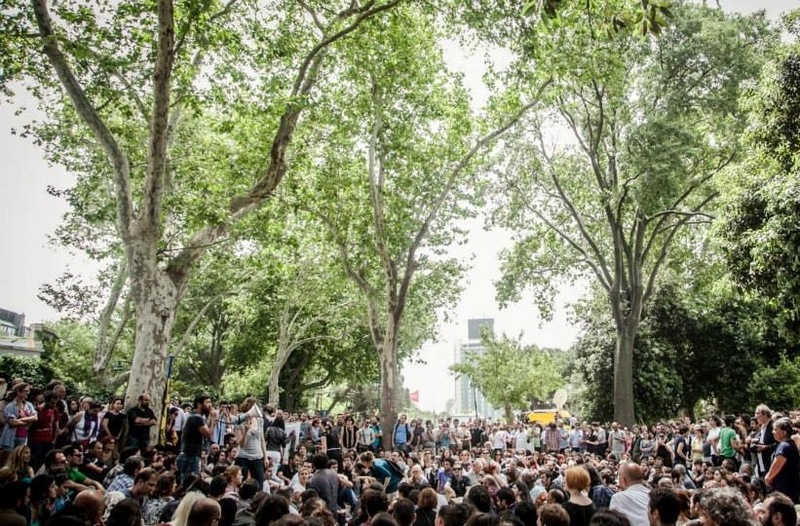 Carl Pope, former chairman of the Sierra Club, argues that efforts to preserve the sycamores in Gezi Park illuminate regimes of access to and control over natural resources in Turkey. He adds that trees become "a tangible symbol of the common space which autocrats claim to serve, but actually destroy." Andy Revkin riffed on Carl's piece at Dot Earth, and Naomi Sachs riffed on Andy's at the Therapeutic Landscapes Network. At local ecologist, I reviewed several local (NYC) conflicts over natural resources: Rudy Giuliani vs community gardens, the Sexton NYU 2031 Plan vs Greenwich Village, and Major League Soccer (MLS) vs Flushing Meadows Corona Park in Queens, though the latter may soon be MLS vs the Bronx. In a political ecology course I took at UC Berkeley, the professor asked us to consider how the "materiality of a resource" influences conflicts over its management. In cities, a spatial characteristic of many resources is boundedness. A park, for example, has definite material boundaries. If someone builds on it, they change the boundaries in significant ways. They diminish public access. They change the way benefits are derived, and by whom. Privatization of public resources — from Istanbul to NYC — diverts their benefits to the few who can afford them. When this takes place undemocratically, it is an injustice to be fought with the collective strength of many. Georgia Silvera Seamans is an urban forester and founder of local ecology. More of her writing can be found at local ecologist. Yes, and even when the owners let people use the space without spending money, privatization makes it easier to limit people's rights to congregate and stage dissent.